How does the Subscription Payment Plan work? The current Subscription Fee is $12,000 which can be paid in full or through monthly payments. The payments will be interest-free, as long as all payments are made within the period determined by the amount of the initial payment. Monthly payments of at least $125 plus a $10 Handling/Transaction Fee will be accepted. There is no pre-payment penalty, so any additional amounts paid over the $125 monthly minimum payment will be applied to reduce the principal amount owed and will reduce the total amount of handling fees you’ll pay. Late fees will apply, based on the minimum $125 payment at the rate of 18% per annum. Once water is available at your property, you will be required to pay the Monthly Base Rate and Water Usage fees, in addition to the monthly payment obligation under the Payment Plan. The payment plan will create a lien on your property until paid in full. How much will the Value of my house go up? No one can tell you what value the tap could add to your property, but here is an article that was published in the Durango Herald on May 30, 2015 states as much as $25,000. This is from a well known local realtor. Read the article here. 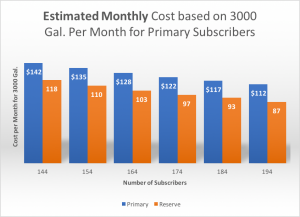 Difference between Blue (Primary) and Orange (Reserve) is cost of water. Orange represents Monthly Base Rate. What makes up the monthly rate? Monthly Base Rate – 1) Debt Service, infrastructure, operation & administrative costs that it takes to provide you water service. 2) Water Usage Fee – cost for treatment and pumping for metered amount of water that you use during a billing cycle, applied per 1,000 gallons. The monthly base rate cannot determined exactly at this time; our current estimate of monthly base rate is about $119 with a water usage fee of $7.50 per 1,000 gallons of water used in a month. 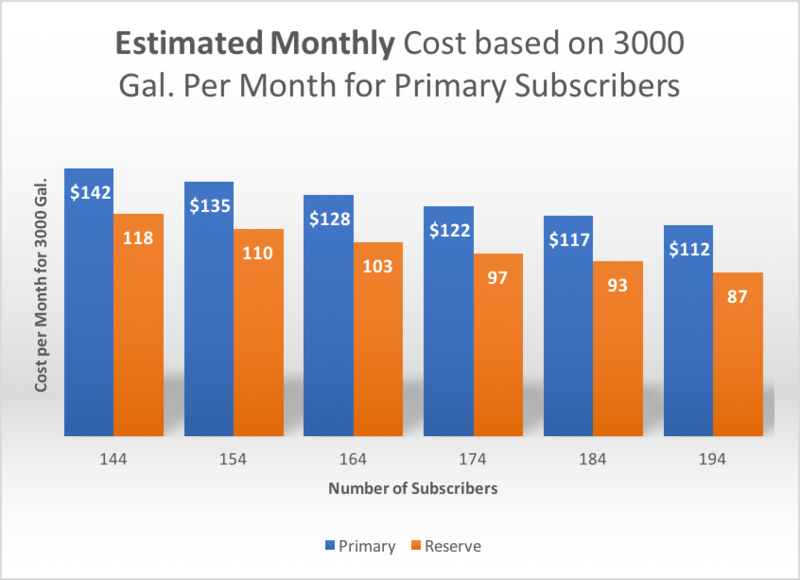 The monthly base rate applies to both Primary and Reserve Subscribers, with Primary Subscribers paying the water usage fee as well. We expect these numbers to go down as we get additional subscribers and finalize negotiations with other entities. Please keep checking back for new rate updates. What is my incentive for signing up now? You will enjoy large savings by signing up now. After design deadline and/or construction, fees could be significantly over $12,000 to connect to our system. The problem is once the system is designed there is only so much capacity designed into the pipe/system that to add an additional tap maybe cost prohibitive or impossible. Our funding agency limits potential growth to the system. Having water delivered to you is more expensive than the water system would be. Board member Ken Spence spends about the same amount as the currently estimated monthly base rate hauling water from Durango, with no allowance for the time he spends hauling water. When will system service be available and when will monthly cost be billed? We anticipate the project going to bid sometime this fall, with construction taking about a year for Phase 1, so service and billing would begin sometime in the fall or winter of 2018.
Who pays the cost of connecting my home to the system? Individuals will be responsible for the cost of connecting the system tap to their home or the Lateral Service Line. This will include earthwork, labor and materials (i.e. pipeline, check valve, pressure regulator and back flow preventer (for wells connected to the system). The estimated cost is $600 but this may vary considerably dependent on your location, distance from the system pipeline, soil composition and a number of other variables. LPWWA will determine the specifications for the meter, materials to be used; the meter pit and its equipment will be property of LPWWA. The Lateral Service Line shall become real property appurtenant to the Parcel designated in the Subscriber’s Water User Agreement. I don’t have enough money to pay for the subscription fee, but I still want to sign up for service. Where can I borrow funds for the subscription fee? LPWWA requested proposals from local financial institutions in early 2014. We received responses from Community Banks of Colorado, First National Bank of Durango, Wells Fargo Bank and Southwest Federal Credit Union of Colorado indicating a willingness to work with individuals to loan funds for subscription fees, with requirements and terms typically depending on the borrower’s creditworthiness. USDA Rural Development Home Improvement Grants & Loans For those who are elderly or low income property owners who occupy their property, loan/grant funds may be available through USDA Rural Development Home Improvement Grants & Loans program. Loans of up to $20,000 are available with repayment schedules over 20 years at 1% interest rates. A mortgage agreement is required for loans of $7,500 or more. Grants of up to $7,500 or loan/grant packages are available to property owners 62 year of age or older, but must be repaid if the property is sold within three years of obtaining the loan. See http://www.rurdev.usda.gov/HAD-RR_Loans_Grants.html, and/or directly call Nicky McCoy at the USDA offices in Delta Colorado at 970-874-5735 for more details. I own property in Phase 1. Can I still subscribe for service? YES. If your property is being crossed by a service line or is immediately adjacent to a currently designed service line, the cost is $12,000, payable in full, or you may arrange to make payments. See FAQ “How does the Subscription Payment Plan work?” for details. If your property is not being crossed by or adjacent to a property with a service line, you may have additional costs for the service line to your property, which could be shared with a neighbor if you both sign up together. What is the deadline for signing up at the current Subscription Fee? YOUR LAST OPPORTUNITY TO SIGN WITH HELP WILL BE JULY 8, 2017, when Board members will be available at the Breen Community Building between 9:30 AM and 4:00 PM to answer your questions and help you become part of the system. Are you one who doesn’t want to participate until you see the pipes going in the ground? We currently have enough subscribers for Phase 1 to proceed so the phase can be built with pipes in the ground. However, the more that sign up before the project enters final design and bid, the less costly it will for everyone. If you are interested in water from the system at any time, this is the best and least expensive time for you to sign-up. See “Can I sign up after the deadline?”, on the next page of this document. If you wait until the pipes are in the ground, it will cost you more. What will the tap fee be for future phase? They are unknown at this time but as each new phase starts construction then we will work on the next phase price. Where will the easement be located? Usually parallel to the roadway unless you and LPWWA agreed upon something else. It will be pin marked at least 2 days prior to digging. What will my property look like when you are done? Restoration work will be done to restore the disturbed area to as good or better condition than it was prior to excavation. Driveways and fences will likewise be restored as close as possible to original or better condition. Where will my water meter be located? Your meter will be located just inside your property line, adjacent to the service line. What if I have something like trees, buildings, fence, etc. that I don’t want disturbed? We would like you to let us know sooner rather than later so let us work together and come up with a final route that works for you. What will the final easement size be? 30’ unless otherwise agreed upon between you and LPWWA. We are happy to meet with you by phone or site visit to discuss your concerns. Can I still drill a new well for domestic purposes? Per Colorado Division of Water Resource rules, future home builders or subdivisions in the service area will be required to connect to the LPWWA system or receive a Letter of Exemption from LPWWA in order to drill a well. Can I continue to use my well for domestic purposes and connect to the system? You may still connect to the system, but state health department requires that if you still use well water, you are responsible for installation of a backflow prevention device, regular monitoring and fees to ensure the backflow is functioning properly. Can I continue to use my well for non-domestic purposes and connect to the system? Yes! If your well does not connect to any of the plumbing that is served by the water supply system, it will not be affected. You may continue to use your well for irrigation, livestock and other purposes if there is no connection to the water supply system. Can I continue to use my well and not connect to the system? Yes! All existing wells are ‘grandfathered’ in and will not be affected if you choose not to participate in the water supply system. What is being required by USDA Rural Development to ensure that there are enough subscribers to make the initial phase of the domestic rural water system economically viable? Our Letter of Conditions from USDA Rural Development requires that we have a minimum of 144 subscribers, which is a condition we certainly meet. Additionally, USDA requires us to develop a POSITIVE PROGRAM TO ENCOURAGE CONNECTIONS, which includes requirements for regulations for the system, installation guidelines and requirements for service lines from meter locations to your property and letters notifying property owners of construction and service availability. You can find the current regulations at http://lpwwa.org/wp-content/uploads/Rules-Regulations-Amended-17-08-09Approved.pdf on our web site. Service line installation guidelines/requirements will be available in the future and will likely be sent out with letters notifying property owners of construction and service availability. Also, owners of property in Phase 1 who do not subscribe for service will be given the opportunity to sign a service declination statement. Will the project continue in the phases currently designated outside of Phase 1? The project will continue, but the area encompassed by the future phases of the project are yet to be determined. The Board will be reviewing boundaries for the next phase of the project during the last months of 2017 and maybe into 2018. Subscription costs for future phases can be developed as phase boundaries are determined and subscriptions for each phase will be accepted as each phase is defined. Subsequent phases may resemble the currently mapped phases, but expansion of the system could occur based on demand in an area that has significant density to achieve effective and manageable costs. A primary design impediment and corresponding additional costs will be challenging whenever the design includes crossing the La Plata River, or other streams or wetlands areas, as additional permitting and costs are required to comply in construction of pipelines across riparian or wetlands areas. I own property outside of Phase 1. Can I subscribe for service in future Phases? Not at this time. Once boundaries for each future phase are determined, we will be able to establish costs for that phase and begin accepting subscriptions for that phase. You are encouraged to start saving on you own, as we do not anticipate the subscription cost for future phases will less than the current $12,000. I don’t see a question I have answered here. Please contact one of the board members to answer any questions you may have. Due to a number of factors, the board has tabled the discussion of a water dock, but will revisit this issue after we have bids for Phase 1. Is LPWWA working with the Lake Durango Water Authority on the project? Yes, Lake Durango Water Authority is building the pipeline at a cost of 2.8 million in exchange for use of our capacity in the intake structure and pipeline. What is the history and background of the project? In the early 2000’s subsequent to the final determination to downsize the Animas-La Plata Project (ALP) and eliminate irrigation water for western La Plata County as originally planned, the Animas-La Plata Water Conservancy District (ALPWCD) created a task force group to learn more about the options for developing a rural domestic water system for Western La Plata County. This task force eventually became the La Plata West Water Company, which received initial funding from the ALPWCD to engage an engineer for preliminary review and design. Work by this group continued through the late fall of 2007, when it was determined that the highest priority at that time was to develop a means to obtain water from Lake Nighthorse without pumping from the base of the dam. The concept for the intake structure was developed and in December of 2007, through sponsorship of the ALPWCD and the La Plata Water Conservancy District (LPWCD), the La Plata West Water Authority (LPWWA) was created to build the intake structure before the ALP reservoir filled. The LPWWA Board engaged EPC Corporation on a design/build basis to build the intake structure. An initial design was developed and a proposal was made to the Southwest Basin Roundtable group. The Colorado Water Conservation Board/Water Supply Reserve Grants program, through both the Southwest and State Roundtable groups approved a grant proposal for a total of $1.1 million that served as seed money for construction of the intake structure. With this funding committed, proposals were made to the Southern Ute Indian Tribe (SUIT) and Ute Mountain Ute Tribe. The SUIT eventually agreed to commit $3,000,000 with the UMUT committing $1,500,000 toward the project from ALP Project Resource Funds. Construction on the intake structure began in the fall of 2008 and was completed in July of 2009. Additional funding from the Southwestern Water Conservation District (SWCD) and assistance from the Colorado Water and Power Development Authority (CWPRDA) enabled the completion of the intake structure and continued operation of LPWWA. With the completion of the intake structure, focus shifted to the development of a treated water distribution system for all of Western La Plata County, exclusive of the area served by the Lake Durango Water Authority (LDWA). A USDA Rural Development application was completed and submitted in late 2011 based on a preliminary engineering design to provide service to approximately 650 locations based on the commitments received by property owners in the spring and early summer of 2010. Funding for the $34 million estimated cost for the comprehensive project was not available. LPWWA engaged Bartlett & West Engineers in January of 2013. A phased project plan has been developed in conjunction with a collaborative effort between LPWWA, LDWA, SUIT and UMUT to construct a raw water pipeline from the LPWWA intake structure to Lake Durango. Under this collaboration, LDWA will have access to additional source water for its customers and will utilize excess capacity in the LDWA treatment plant to treat water for initial phases of the LPWWA distribution system. The two initial phases of the LPWWA distribution system are generally south of CR 141 and east of the La Plata River, with the split between Phase 1 and 2 being slightly south of Kline. LPWWA is considering various options to provide a water dock facility for property owners outside of Phase 1. A series of community meetings will be held during September 2014 to provide update information to property owners in the entire potential service area and neighborhood meetings will take place later in the fall within Phase 1 to begin the easement acquisition and sign-up process. In addition to the 100 or so properties committing to service in 2010, around 120 new subscriptions within Phase 1 are needed to make the $3.85 million cost financially feasible. We anticipate obtaining funding from USDA Rural Development for this phase. The deadline for all subscriptions is half of the tap fee to be collected by late April of 2015 and 2nd half will need to be collected by mid August of 2015. There could be a significant increase in fees for signing up after the August deadline, and great fee benefits in signing up before the deadline! Are You on Tap? Isn’t the Lake Durango Water Authority “taking” water intended for the Dryside? The Animas-La Plata project can store up to 120,000 acre-feet of water, there is no water allocation designated solely for the ‘dryside’. LDWA has purchased an allocation directly from Animas-La Plata. Was the water allocated by the Animas-La Plata Water Conservancy District intended to be used for the Western portion of La Plata County for a domestic water system? Yes, the uses are municipal and industrial only. The final ALP Project was downsized and eliminated irrigation. If I’m not in Phase 1, when can I expect service? Future Phases are estimated to begin approximately one year after the previous phase starts construction. Can I use one tap for more than one home? 1) Primary subscription: Service for a single Dwelling Unit, a single Commercial Unit, or a single Multi Unit Dwelling. A Primary Subscription entitles a Subscriber to one (1) Service Connection to the La Plata West Water Authority water distribution system. 2) Accessory subscription: An accessory subscription is required for each additional dwelling unit, to provide service for up to two (2) additional Dwelling Units on the Parcel served by the Primary Subscription. An Accessory Subscription cannot be sold or transferred separate from the Primary Subscribership. If units served by an accessory subscribership are located on a parcel that is severed from the parcel for which a primary subscribership is held, the accessory subscribership must be upgraded to a Primary subscribership and have its own meter pit installed to service the severed parcel. 3) Reserve subscription: A reserve subscription is available to reserve capacity in the system at current costs, essentially reserving service for future use. Reserve Subscribers are required to pay the monthly base charge starting when service is available to their property and will pay an additional $2000 (cost of the meter pit) when a meter pit is to be installed and full service commences for the subscription. Can I buy a tap for a vacant parcel? Yes. You may buy as many taps as you choose. Please keep in mind that a tap does NOT create a right to develop or subdivide; this is determined by the La Plata County Land Use Code. The proposed land use for the Fort Lewis Mesa Planning District is 1 home per 35 acres or a 2 per 40 base density utilizing conservation cluster design. Recent proposed changes in County regulations may allow for 35 acre parcels to be split into two parcels, with a primary and accessory dwelling on each parcel. Where will water for the domestic system come from? The LPWWA system will be supplied by water from the Animas-La Plata Project. The funds that LPWWA will receive from USDA for Phase 1 cover the costs to purchase the ALP water allocation. Why has the project been broken into phases? The project was broken into phases primarily to achieve financial soundness for the project. Phasing, together with the agreement with LDWA to provide treated water, creates an estimated cost of about $3.85 million for the first phase of the project.